As they do every year, the Arizona Diamondbacks introduced several new extremely tasty and unhealthy food items in time for the 2019 baseball. Fortunately (or unfortunately, depending on your point of view), the Churro Burger isn’t one of them — even though one prominent national reporter was convinced it was for a short time Monday.On Monday, which happens to be April Fools’ Day, the D-backs tweeted a photo of a supposed new food item to be offered at Chase Field this season. 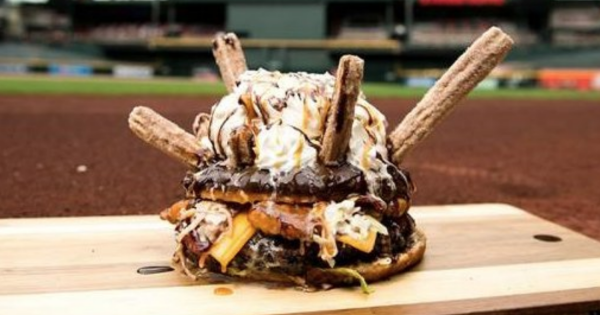 The Churro Burger, according to the D-backs’ feed, is “1.5 pound bratwurst burger, 4 cheddar slices, 5 strips of bacon, and mac cheese bites served on a chocolate iced Texas Donut with fried cinnamon sugar churros, vanilla ice cream, and toppings.”Oh you thought the new #DbacksEats were done?Introducing: The Churro Burger.1.5 pound bratwurst burger, 4 cheddar slices, 5 strips of bacon, and maccheese bites served on a chocolate iced Texas Donut with fried cinnamon sugar churros, vanilla ice cream, and toppings.😋 pic.twitter.com/p223k72qzB. 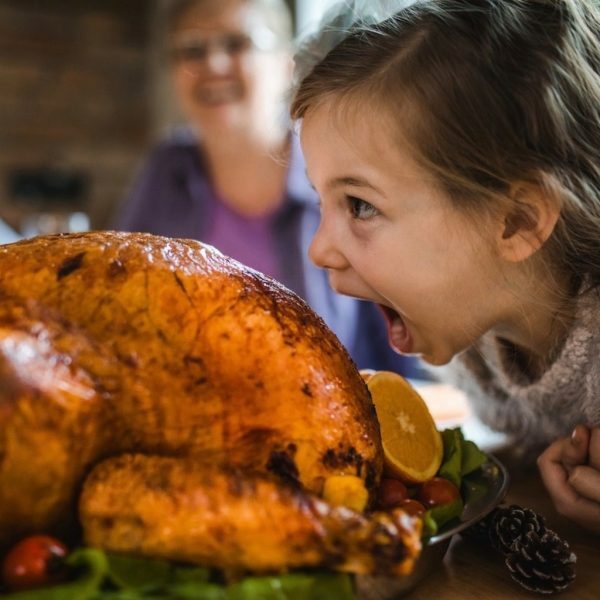 April 1, 2019Most users who came across the post seemed to realize this was an April Fools joke. But not Darren Rovell, a longtime sports business reporter who used to work for ESPN and now works at The Action Network.Rovell, who has over 2 million followers, often announces new food items at ballparks and arenas — and he was initially upset that the D-backs didn’t give him advanced notice of the Churro Burger before making the news public.So, Rovell reached out to Josh Rawitch, the D-backs’ senior vice president of content and communications, who was happy to bring Rovell in on the joke.I need to slow down. I just called at the Diamondbacks angry that I didn’t get a first look at this one.“April Fools.” https://t.co/PLFGso86TmApril 1, 2019Respect to Rovell for admitting he was fooled. And as it turns out, he wasn’t alone: Yahoo Sports was also fooled by the Churro Burger. South Africa's cameramen are fast becoming the most prominent broadcasters since the 12th man turned Joe the cameraman into a cult hero. He attended a 2017 camp in Nashville and a 2018 experience in Los Angeles and became the featured artist on the Nashville album on SoundCloud. 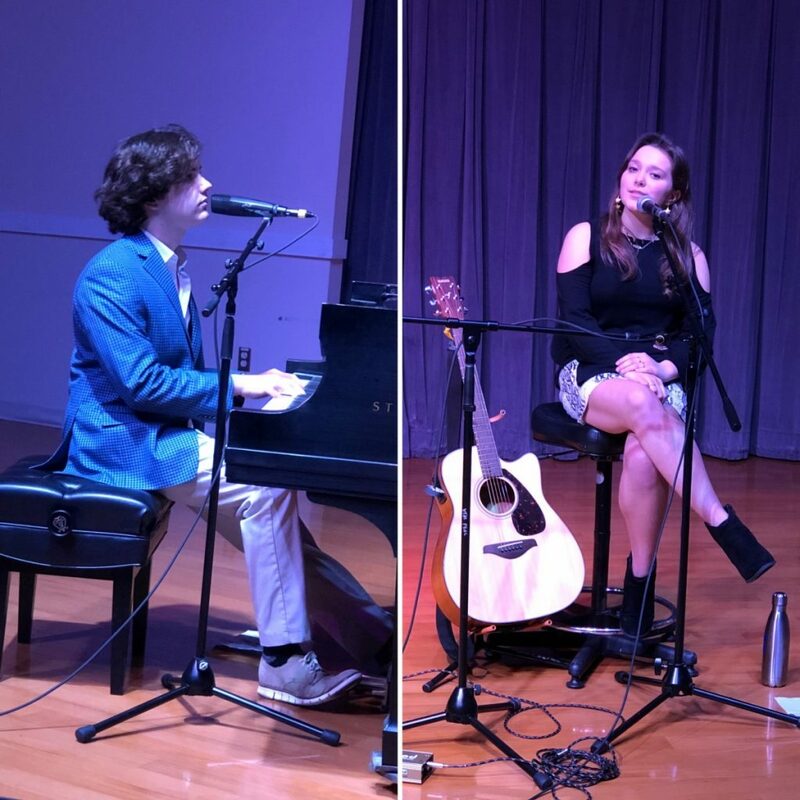 Harrison Finks and Evie Grace Fowler belied the event’s title as they quickly proved to be established performers, comfortable in the intimate setting of UTM’s Blankenship Recital Hall. Finks, at 16, brought an extensive resume to his piano bench, including back up for American Idol finalist Jessica Meuse, sitting in with BB King’s All Stars and Memphis Soul Remedy, a regular gig with a Beale Street band and playing organ and piano at his ethnically diverse church in his hometown of Memphis. Fowler, a 15-year-old singer/songwriter proved equally adept at expressing her own lyrics and the familiar phrases of several pop tunes. Her original song “Last Days,” included in Monday night’s set, was released in April of 2018 and can be found on iTunes and other outlets.As frequent contributors of talent to various fundraisers, the couple was drawn to this most recent endeavor partly because of ties to the area. Finks’ grandparents Joe and Shirley Willhite are Martin residents and his grandmother was a professor at UT Martin for more than 30 years. Both sets of Fowler’s grandparents (Linda and Travis Shumate and Paula and Randy Chapman) are Union City residents. The concert benefitted the UTM Community Music Academy and the fledging Weakley Arts Can advocacy effort which Dr. Julie Hill, the chair of UTM’s Department of Music and one of the hosts Monday evening, is helping to launch. In a meet and greet reception for the artists and supporters prior to the concert, Hill reflected on the course-setting encouragement she received as a young music student at Martin Elementary. She then expressed regret that overall the arts have “declined in the area, in our schools and communities. ”“Students need the opportunity to draw, to act, to dance, to play,” she said. “That’s what tonight is about. ”The Community Music Academy provides affordable music lessons for young people in western Tennessee and Kentucky. The Weakley Arts Can organizers are looking to increase interaction with the arts for students across the county beginning with a request for yearlong elementary music and art.